I had a routine. I’d walk into town, a couple of miles from the college, and swing by the comic book store. I’d buy whatever was new. It might have been Battle Angel Alita, The Maxx, Strangers in Paradise or just the latest Batman, but I always picked up two or three issues. Then I’d hike over to the McDonald’s on Colman St., on the edge of the city, and sit for a while reading comic books and eating McNuggets. For a while, all the chaos in my head stilled, and the world was nothing but a plastic seat, Batman, and some greasy food. 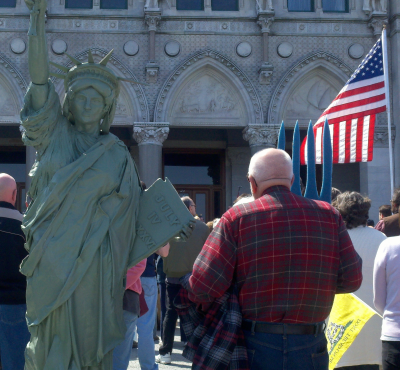 I went to a Tea Party rally for no good reason, except to take pictures and write a report. Yes, the signs were amusing. Yes, they had foam pitchforks. The report is here: Tax Day Rally Fizzles. It has to be a frustrating time for the Tea Party. In Washington, House Republicans are compromising with the hated Obama on the budget and may yet allow the debt limit to be raised. Here in Connecticut, Democrats likely have the votes to pass big tax increases as part of an effort to close the budget gap. The big wins of last year are already fading from memory, and no one seems all that excited about 2012. Unlike 2009 and 2010, there is no one single bill to rally against, no one unifying task. Two other articles: The Myth of the Easy Answer, which has a lot of my political philosophy in it, and Budget Deal Winners and Losers, which has, um, those. I did a guest post at Reading With Tequila, about superheroes! It wasn’t part of the recent blog tour, so I’m linking to it from here. In a lot of ways, superhero stories are about those who are different or special in one way or another. Here are people who either have inborn or contracted special abilities or powers, or who are in some other way extraordinary. And that’s it for now! There’s some big big news to talk about soon, too!